Istā GOTIŅA There are 7 products. 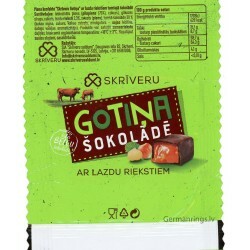 The original Latvian candy wrapper in a good condition. Circa present day. Please see scans! 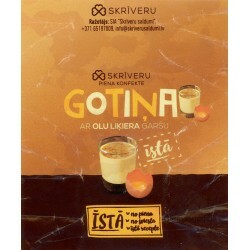 Title- GOTINA with egg liqueur flavor Brand - Skriveri Dimensions –apprx. 7,5 cm x 9,0 cm Material –paper. Language – Latvian. The pictures are from actual item that you will recieve. 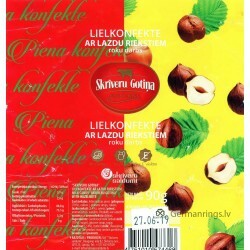 The original Latvian candy wrapper in a good condition. Circa present day. Please see scans! 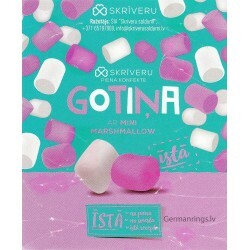 Title- GOTINA with mini marshmallow Brand - Skriveri Dimensions –apprx. 7,5 cm x 9,0 cm Material –paper. Language – Latvian. The pictures are from actual item that you will recieve. The original Latvian candy wrapper in a good condition. Circa present day. Please see scans! 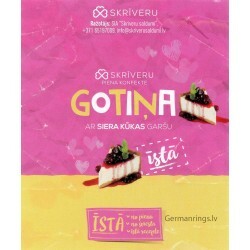 Title- GOTINA with cheese cake flavor Brand - Skriveri Dimensions –apprx. 7,5 cm x 9,0 cm Material –paper. Language – Latvian. The pictures are from actual item that you will recieve. The original Latvian candy wrapper in a good condition. Circa present day. Please see scans! 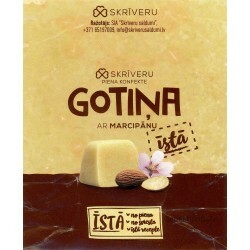 Title- GOTINA with marzipan Brand - Skriveri Dimensions –apprx. 7,5 cm x 9,0 cm Material –paper. Language – Latvian. The pictures are from actual item that you will recieve.